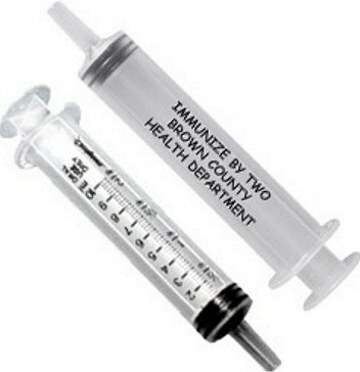 Bulk personalized oral syringe -medicine syringe at the lowest price in USA and Canada . American clients pay no taxes. We also supply blank (not imprinted) wholesale oral syringe: see the Price Table. Oral syringe are very useful for dispensing oral medicine with precision. They measure in 1/2 teaspoon and 1 cc increments up to 2 teaspoons (10 cc). We also supply 0.5 ml, 1 ml, 3 ml, 5 ml, 20 ml and 60 ml oral syringes. Please contact us for pricing. Free artwork design. We will send you a proof for your approval before production. Basic prices are for blank (not imprinted) oral syringes or for personalized oral syringes with 1-color imprint. Add the prices shown for extra colors. Imprint Area: 2 1/4" x 3/8"